This is a good ECE project report on GSM based Gas Leakage Detection system which can be used to detect dangerous gas leaks in the kitchen or near the gas heater. This is a microcontroller based project. 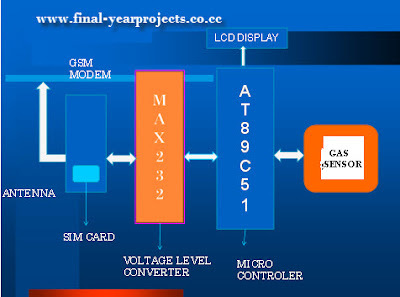 In this project there are mainly two units, GSM modem and microcontroller unit. GSM modem can be configured by standard GSM AT command set for sending and receiving SMS and getting modem status. Report also tells precautions to be taken when gas leakage detected. You can also Subscribe to FINAL YEAR PROJECT'S by Email for more such Projects and Seminar. This unit detects 300 to 5000ppm of Natural Gas. Ideal to detect dangerous gas leaks in the kitchen. Sensor can be easily configured as an alarm unit. The sensor can also sense LPG and Coal Gas. The report contains component list, full AT command programming to configure Modem, Block diagram and circuit diagram of GAS leakage detection system. Use this report for your reference and study.